Renoir is a bright representative of impressionism in painting. In 1874, he painted his famous painting “The Dancer.” In it, we can fully see the artist’s refusal from a clear outline, we see a blurred background, which only reinforces the impression of movement. Renoir used paints, mainly pastel colors, which repelled the light. Thanks to their use, he managed to create a certain glow of his paintings. The painting depicts in the central part of the canvas a young girl who is dressed in a ballerina costume. She stands half-turned, her legs took the position number 4 (from the ballet), her left shoulder she naturally pulled back. Her whole pose and tells the audience that the girl likes to engage in this kind of art. Renoir managed to convey all the weightlessness of the tutu, to show how transparent the fabric of her dress. To convey the entire lightness of the garment, the author uses a large number of light smears, which seem to create a soft contour. The skin of the girl is very light, almost snow-white, very advantageously shaded by small ornaments on the neck and arm. The background was specially selected by the author in such a way that there was a contrast between the light figure and velvet shadows. 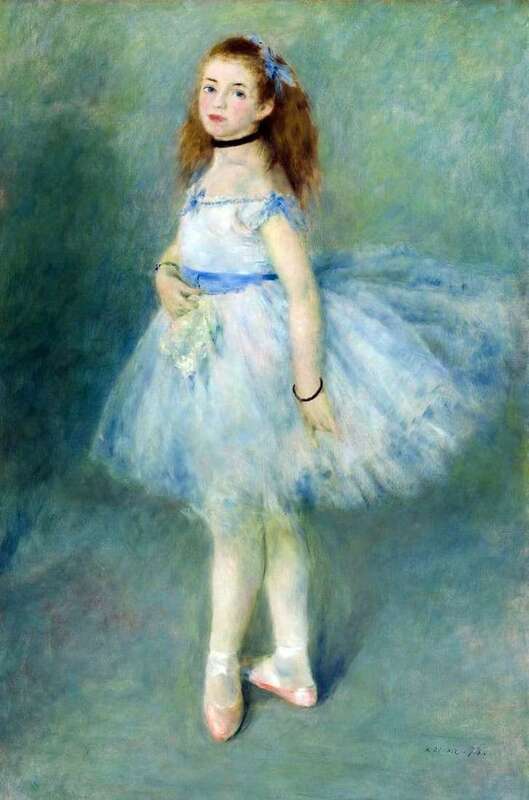 Renoir wanted to show the young ballerina not in the image, but in the role of herself. The artist attaches great importance to her eyes – a little sad, but that’s why the girl is no less attractive. We can note how tender and quivering she is posing in front of the artist. Today, “The Dancer” is stored in Washington, in the National Gallery of Art.